Paul Carruthers Manufacturing Jewellers was established in 1980 in the heart of the Newcastle CBD, and has been providing quality service and fine jewellery for over 30 years. Customer satisfaction, honesty and integrity are of paramount importance to us and these strong foundations along with a pragmatic approach have earned us an extensive and loyal clientele, some of which span three generations. The company has maintained its reputation for creating unique and beautiful jewellery of an exceptionally high standard, ranging from the simple elegance of classic design to the romance of antique/old world design to cutting edge contemporary design. We continue to evolve and strengthen with our talented team of innovative jewellers contributing their own distinctive flair and individual perspectives when designing and making unique quality jewellery tailored to meet your tastes and desires. Let our highly experienced staff support and guide you through both the complexities and great joys of choosing the right design for your very special piece of jewellery. Our vast experience and knowledge enable us to give you accurate and informative advice on perhaps one of the most important decisions that you may make. We take great pride in the fact that our jewellery will be worn with pleasure for many years and will become a treasured heirloom. 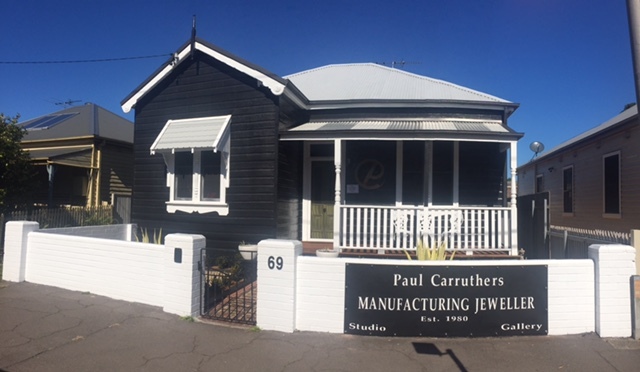 Paul Carruthers Manufacturing Jewellers are members of the Gold and Silversmiths Guild of Australia and the National Council of Jewellery Valuers. Jewellers must satisfy stringent criteria before being accepted to these bodies. Members are selected due to their strict adherence to industry best practices and in respect of the uniform code of ethics.